Amethyst derives from the Greek word amethustos, or “without drunkenness.” The stone symbolizes sobriety, humility, and healing. The color of the crystal varies from light red to deep purple, and it is found in a striking variety of formations and sizes. Greeks and Romans decorated their goblets with the stone to prevent excessive drunkenness. According to the Roman poet Ovid, Bacchus — the god of drunkenness and passion – once became angry and vowed that the next person he met should be torn apart by tigers. He regretted his curse when he saw the beautiful girl Amethyst approach, and with the help of the goddess Diana, the maiden was transformed into a crystal to escape the tigers. The amethyst has also been called the “Gem of Fire,” and it was worth more than diamonds in some places and times. Its price declined in the 1800s when deposits were discovered in Brazil. It was popularly referred to as The Bishop’s Stone and was worn by religious leaders in Europe because it symbolizes piety and humility. This symbolism made the amethyst a sought-after stone for rosaries and prayer beads. The stone represents the month of February and became associated with Valentine’s Day, when gifts of amethyst jewelry expressing fidelity and commitment are often given. The stone is also connected with the sixth and 17th wedding anniversaries. Leonardo Da Vinci wrote that the amethyst stimulated the intellect and eliminated negative thoughts. It was traditionally used to guard against witchcraft and poisoning, and it was worn by travelers and soldiers as a shield from harm. The amethyst represented the Hebrew tribe of Dan on the breastplate of the High Priest who served in the Holy Temple in Jerusalem, and the Egyptian Book of the Dead instructed that heart-shaped amethysts should be placed on the bodies of the deceased prior to burial. The amethyst is used frequently by healers to channel positive spiritual energy. The stone is thought to improve circulation and treat breathing problems. A number of healers suggest putting the stone in a place with plenty of sunlight to remove negative energy from the surroundings. The stone is said to soothe headaches and treat insomnia when placed under a pillow. Larger amethysts usually have an uneven color due to the stone’s stratified structure and the presence of iron. The crystal tends to change color when heated. Two-tone amethysts, which are relatively rare, are found in Bolivia. The countries that produce the greatest quantities of amethysts are Brazil, Uruguay, and Madagascar. 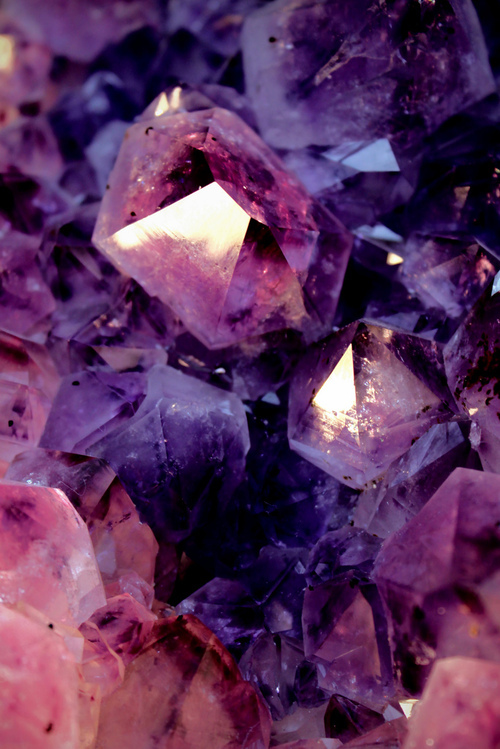 A large number of amethysts were also discovered in Aztec. Some are found in Amethyst Harbor on the Canadian side of Lake Superior. The minerals appear in igneous rocks, and some are tiny while others are as large as a fist. Amethysts were once closely associated with bishops and ecclesiastical figures, but now they’re a favorite of celebrities at red carpet events. Drew Barrymore, Jennifer Garner, Katy Perry, Zoe Saldana, and Sarah Ramirez have all been photographed wearing various forms of the purple crystal. Visit Diamonds Forever in San Diego and browse through the elegant selection for your own unique amethyst piece.